I bought it off Ebay, and should have it very soon. It's coming from Arizona. The problem is these cacti are native to Arizona, where the soil is river bed silt and sand. 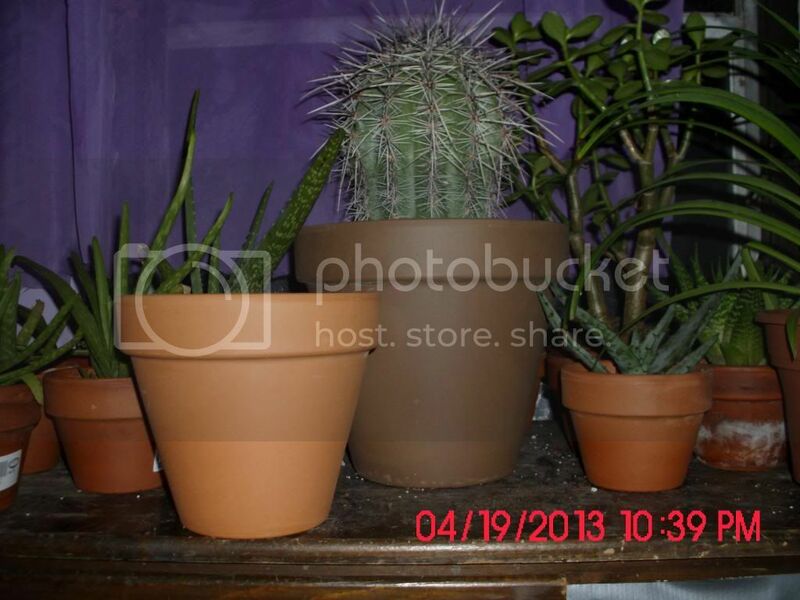 The cactus / succulent mix I have is nothing like it, and I fear may be too nutrient and organic. I want this cactus in the soil it is used to so it can thrive, but I live in Pennsylvania, and have no idea where to get river bed silt (not sure if the stuff in the rivers by me is the same). Could I just add sand and something else to my cactus / succulent mix to provide better drainage? The other thing is that silt and sand have a way different PH (acidity) than organic mix, and contain hardly any nutrients. The cactus / succulent mix I buy is probably loaded with nutrients, and that's not what the cactus is used to. I could of have it shipped in the pot with soil, but that would have raised shipping costs A-LOT, and is irrelevant at this point. I also messaged the seller yesterday for advice, but he has yet to get back to me. 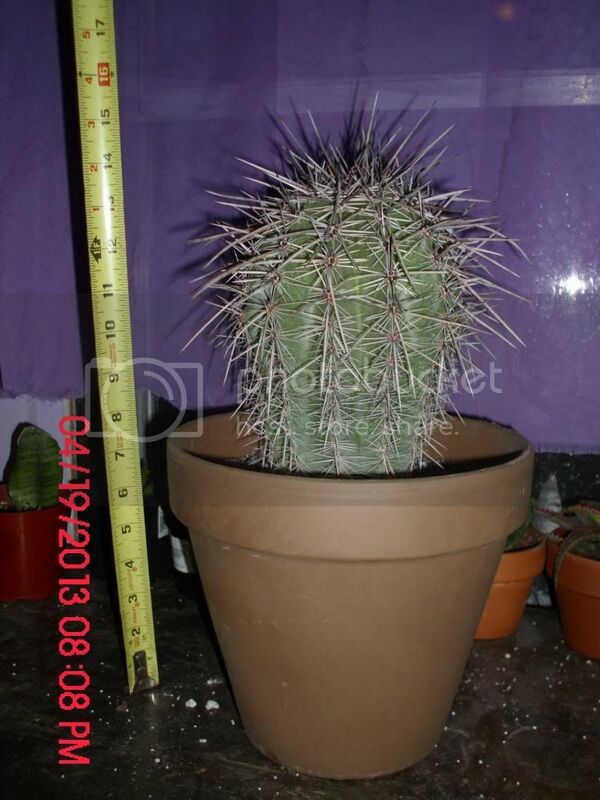 Can anyone give advice as to what to plant this Saguaro Cactus in when I get it? I want it to be happy. OK, the seller got back to me, and said that they do "OK" in the cactus mix, but he suggested 1/3 compost, 1/3 very coarse sand, 1/3 perlite. I then asked him if I could substitute the compost with the cactus / succulent mix, and am waiting to hear back again. Would I be able to substitute the 1/3 compost for 1/3 cactus / succulent mix? I mean, there's no such thing as too much drainage.......right? The cactus / succulent mix that I buy has A LITTLE bit of sand and perlite, but not much, and it still holds water pretty good. Thoughts please? I haven't been able to "visit" the forum for a couple of days, but I see that you've had no responses. It could be that viewers are reluctant to post because many of the saguaro cacti being offered for sale, esp. on the Internet, have been collected illegally. Specifics about the root structure and needs of the saguaro are here; its taproot is approx. 2 feet long, and the rest of the roots reach out from the plant as far as the plant is tall. Although not technically "endangered," the Saguaro is a slow-growing plant with specific cultural and climate requirements. Collecting one needs to take place under specified legal conditions (see first link). The World Wildlife Federation has a good page on questions to ask about a collected cactus plant. Thanks for your reply, I understand your concern about illegal cacti. I purchased this one from a Saguaro farmer, and I believe that he grows his own, and does not collect them from anywhere. He has his own store called Daves Saguaro Cactus, and seems very legit to me. I guess Saguaros are his main focus, and I encourage you to look up his store to see what you think. How could he have a store called "Daves Saguaro Cactus", if he was selling illegal cactus? Wouldn't someone see it, and shut him down? Please let me know what you think of this guy, so I know what I'm getting here. I also know what mix to make for it. It will be my first time mixing my own soil, and I'll probably never go back to the premix soil. Here's a pic of the first pot I bought for it. It's the empty one to the left front of the Saguaro. I know it looks like a better fit, but the roots are pretty much hitting the bottom, but I could get it in there if I had to. Whadya think I should do? Oh, and I made a super airy mix with perlite and sand, so It's not just in cactus mix. Thanks guys. First, I'm glad that the plant arrived safe and sound. All thorns intact, no breakage in the surface. Second, I'm glad you were able to contact the seller about the size of the pot. I was going to advise against repotting simply because the plant had just been shipped, and plants can go into shock from too much change too fast. 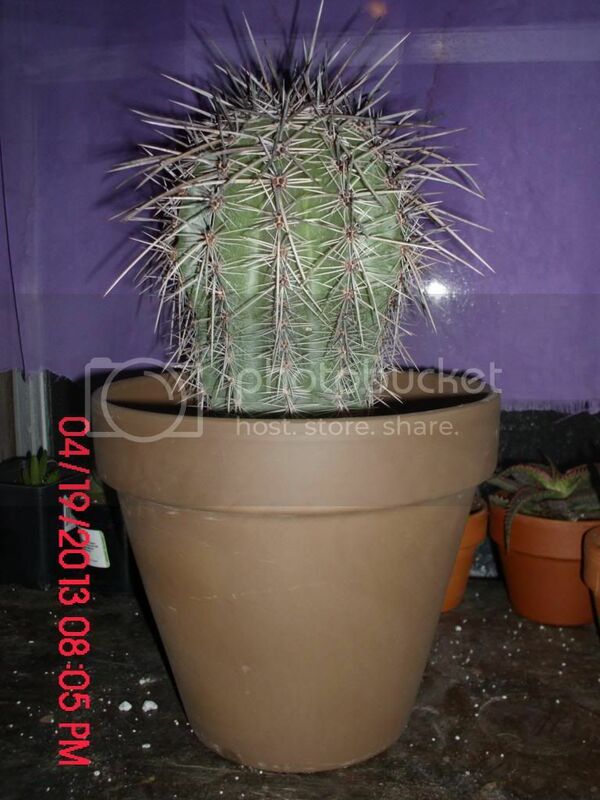 Third, I'm glad to see that the grower--who no doubt has more experience with cacti than I do (a few in my middle-school classroom a while back; cacti were safe from the students' "tender" explorations)--agrees with my instinct that the 8" terra cotta is the correct size. Give the roots some room to explore, but not too much room. Be sure that, when you water the plant (seldom, I hope), the water drains freely and the plant doesn't stand with its feet in water (i.e., a tray). Trays are good for protecting the furniture, but if the tray is accumulating water, simply walk plant + tray to a sink and empty the excess water. And make sure the plant gets enough light to keep it happy. Last edited by baileysup on Sat Apr 20, 2013 1:34 pm, edited 1 time in total. I think the product that I seek is "FINISHED" compost. I guess the compost at my nursery wasn't "FINISHED", and that's why it had LOTS of twigs and wood in it. Does that sound about right? Were you at an independent nursery, or a big box/big name "gardening center"? I'd recommend seeking information at an independently owned and run nursery. Such a place is likely to have small quantities of finished (= fine particles) compost, coconut coir, and the like. It might even have planting mix suitable for cacti and other similar plants (some succulents, for example). Whenever I've asked for help or assistance at an independent nursery (there are two within a reasonable driving distance of my house; a third is 40 or so minutes away in good traffic conditions), I've been very pleased with both the information received and the cheerful way in which it's been delivered. I second your choice of coconut coir as an ingredient of the planting mix, BTW. I'm just sorry that I can't give you specifics on a good blend. The only succulents I have are quite blasÃ© about their planting medium and grow in a blend of sandbag sand (one of my stormwater/flash flood sandbags ruptured), my own compost, and "potting mix for containers." Thanks Cynthia. There are two independent nurseries in my area, and neither had pumice or coconut coir. I may have to get those online. I forgot to check the compost at the one nursery, as they may have some good stuff. The mix it's in now is PLENTY good until I can create my ultimate mix. One question though: how long would you leave it where it is until potting it in the ultimate mix? I figure at least a month. I cant even water yet it for two weeks. If you have confidence in your seller, he's the best source for info on how often to water the plant. My experience with cacti is limited to those I had in my classroom, which were the usual small cacti specimens available almost everywhere for low prices. I bought them at one of "my" independent nurseries, b/c I needed advice on how they'd do in a classroom. Needless to say, the poor plants got too much water and too little light. The kids wanted to "help" the plants *sigh*, and my portable classroom didn't have any windows. The years that I had a regular classroom, I had windows, but the two portables didn't. Those cacti were flexible little beasts, let me tell you! I put them out every afternoon after classes while I graded *some* papers, maybe 1 to 1.5 hours? Then, on holiday weekends (e.g., Thanksgiving), they went home for a little more sun, and the summer was a major R&R with sun for them. But in September it was back to the classroom--and, of course, I never knew until the day I reported which classroom I'd have. baileysup, I am sorry, but I cannot offer you any potting mix advice. I have not heard of anyone attempting to grow saguaro in a cold state, which is not to say it doesn't happen. They are native to the Sonoran regions of AZ and Mexico and will not even grow in the high deserts of Arizona. Wild saguaro are long lived, and slow growing. A 10 year old saguaro is usually about 1 1/2 feet tall, since their first years are spent mainly growing out their roots to support the (eventually) tree sized trunk. They can live as long as 200 years and grow to an average of 50 feet, producing limbs after about 50 years. Though the tap root can get to 2 feet long they also have 2 other types of roots. One grows horizontally to 2-3 feet in diameter in a mature cactus and the other grows down as deep as the cactus is tall; these are all the fine roots you'll see when you do up-pot. After like 15 years if your cactus gets enough sun and proper drought/water conditions (light infrequent water in winter, deep infrequent water in the spring) they'll make beautiful butter colored flowers that open only in the evening. It won't fruit all on it's lonesome; takes two saguaros to tango. Though the saguaro is not currently listed as endangered, it is protected by the government as it is a target for poaching and the number of wild saguaro is quickly diminishing. The sate issues HUGE fines and/or jail time for damaging, up-rooting, moving or removing any saguaro from the desert. Having said that, I am quite sure the state of AZ will not be coming after you and I truly hope you get many years of enjoyment out of your little (for now) piece of the desert southwest. This Dave's Saguaro Cactus, unfortunately, is not a BBB accredited business. The phone number listed goes directly to private voicemail with no recorded greeting and the address is a private residence in Glendale. Google maps shows a small house with even smaller yard with two large hoop houses covered in black tarps, certainly not a "farm" or "nursery". This is almost certainly not a licensed business. Of course, I don't think you're trying to do anything wrong, but from the outside looking in, Dave is. Personally, I would not do business with them as I don't see how or why they would be growing saguaro from seed to 10 year old starts under black tarps.